WHAT is mission? WHY is mission important? WHERE is mission? WHO is a missionary? HOW is mission accomplished? WHEN is mission? Discover twelve in-depth answers that could revolutionize your life. 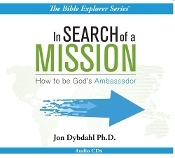 Dr. Jon Dybdahl shares Biblical ways you can be God's ambassador today. Your horizon is about to expand. Are you ready for an incredible adventure? Jon Dybdahl Ph.D. is retired President of Walla Walla University. This series was recorded while Dr. Dybdahl was Professor of World Mission at Andrews University Theological Seminary. His teaching reflects more than twenty years of pastoral and teaching experience in Southeast Asia, a PhD in Old Testament, Missiology, and Semetic Languages from Fuller Theological Seminary, and thirteen years as Professor of Old Testament Theology at Walla Walla College. You'll appreciate Dr Dybdahl's practical discoveries from the Bible.